Each month, Erin at Earrings Everyday offers up an earring design inspiration. This month, she chose the Pantone Color of the Year, Living Coral. While I've never really been drawn to pinks, oranges, and peaches, I have recently come to appreciate the blend of colors in a good coral. Even with that appreciation, I have to confess that I put off this challenge for far too long. Trying to juggle all the challenges and inspirations I found this month has taken its toll in that not everything is getting the attention it deserves. But, I did set aside almost all of yesterday to focus on this challenge, and two pairs of earrings were eked out! 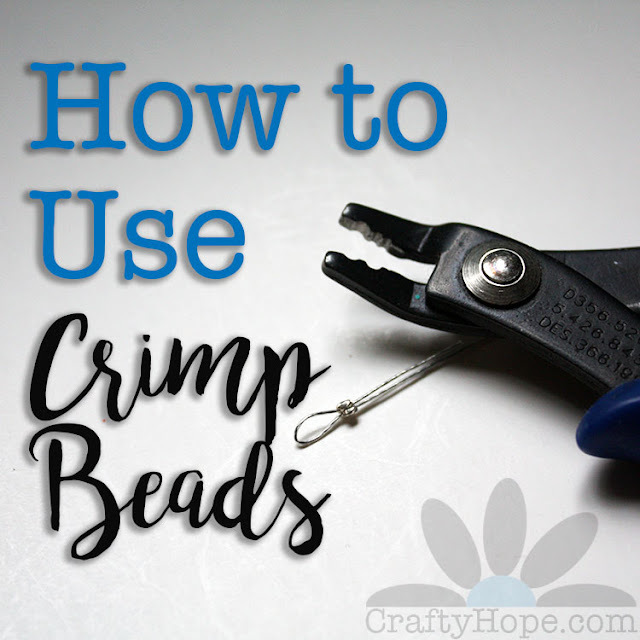 To begin the process, I pulled out everything coral I could find in the craft room. Part of the inspiration that Erin shared for the challenge were several Pantone palettes in which Living Coral is featured. I was particularly drawn to the "Under the Sea Palette" because of the variety of colors. 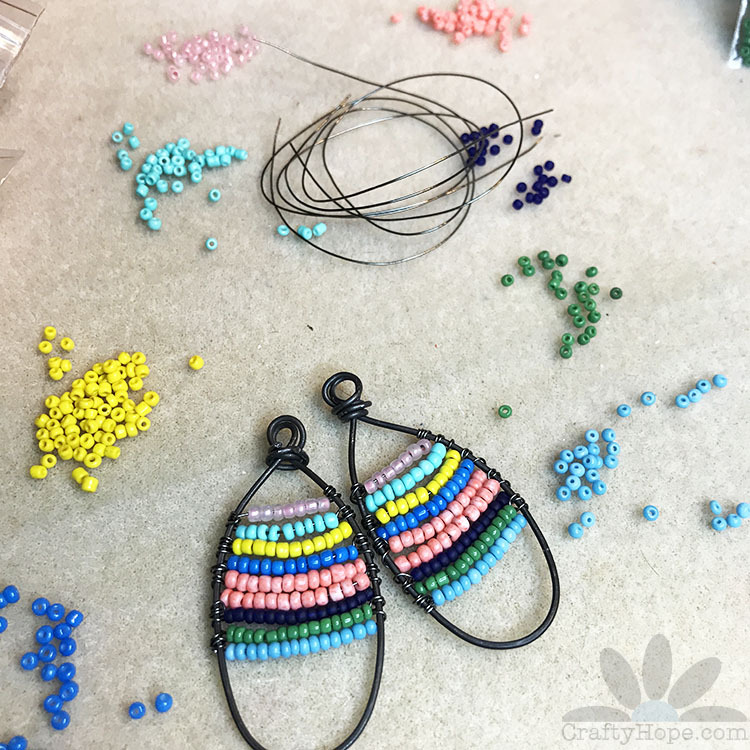 Unsure how to incorporate so many colors into the small space of earrings, it finally dawned on me that I could use smaller beads and a wire frame to pack in all the colors. Since I didn't have any small coral beads, I put white seed beads and e-beads in a small plastic container, added a few drops of the coral Vintaj Patina, and shook the fire out of it to make my own. 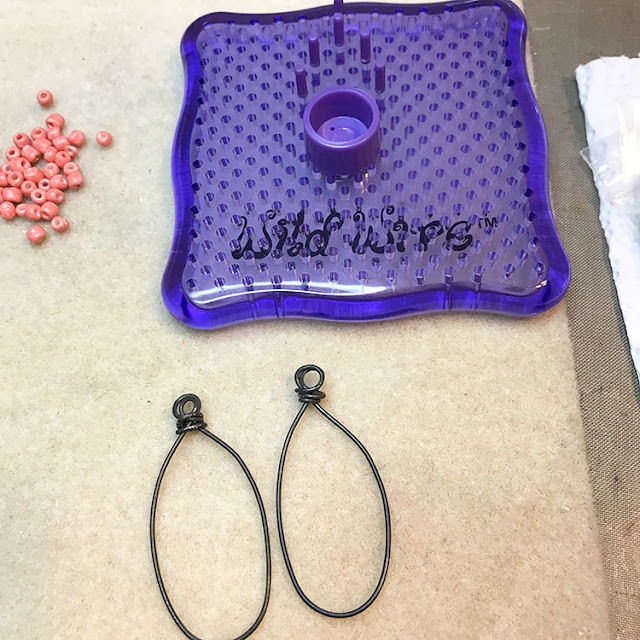 As well, a wire jig was used to create a wireframe for the first pair of earrings. You can see some of the e-beads I made in the upper left. I ended up using the seed beads instead, even though they didn't color as well. From there, I got to stringing on beads. While I own more seed beads than any non-beadweaver probably should, I still didn't have exact colors to make up the Under the Sea Palette. I made it work the best that I could. Once the beads were wrapped onto the frame (after about three tries to get them the way I wanted), jump rings and ear wires were added to finish them. The colors are definitely not as pretty as the inspiration palette, and I really am not keen on that pink at the top. They still work. 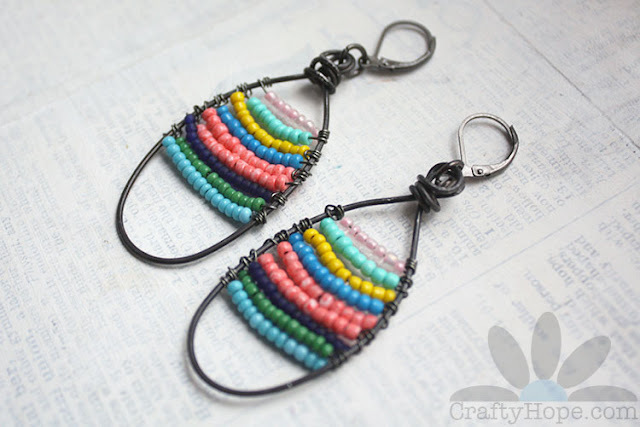 I did put two lines of the coral beads so that it would be the main color for the earrings. And, if you don't know what the inspiration was supposed to be, it's not that big of a deal. I suppose. While I really do like the idea of the above earrings, they just didn't feel like "me". I knew it was time to cut into that tin. I had an inkling of an idea that I just couldn't shake. The vision of a bead hanging in the center of the tin kept running through my head. I was happy that the inside of the tin was gold-colored as I had envisioned the living coral paired with gold. 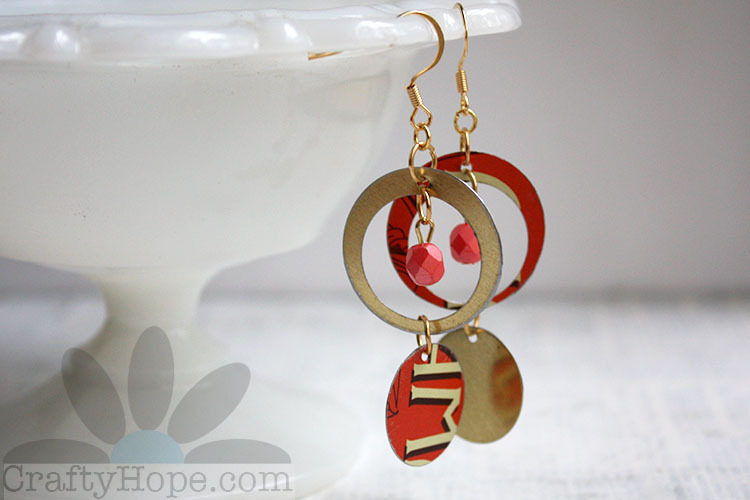 And, the bottom dangles are the circles that were punched from the centers. They worked perfectly as charms. 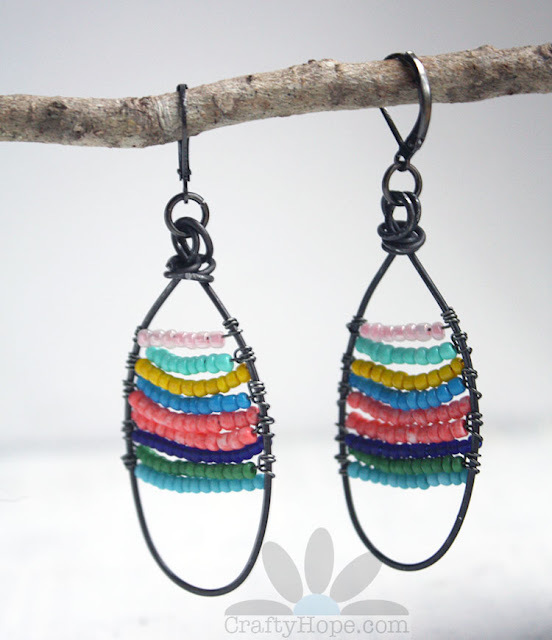 Even better, they're "reversible", giving the earrings interest as they hang and swing. 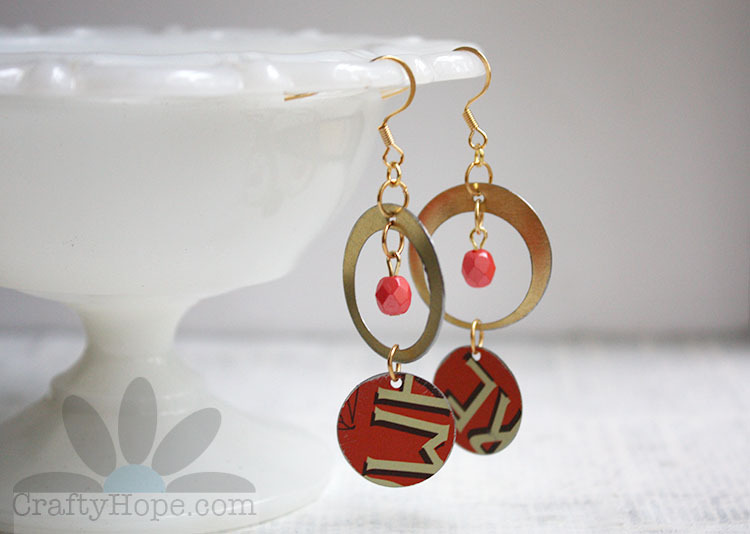 These earrings feel a little more "me", though the color isn't one I would usually have picked. That's what I love about these challenges. They make you think outside your own little box and preferred palettes. Thanks for that, Erin!! Now, hop on over to the We're All Ears Reveal and see what the other artists created with Living Coral! I am with Erin... never thought of painting tiny beads. Amazing. Both pairs are so different and both are so lovely. Janine, It was a super simple process! And, it totally helped me out since I was in a bind for time. I'm happy you like both pairs and appreciate you taking the time to come by and say so. Thank you! I absolutely love that last pair of earrings. The colors and design are perfect. Your earrings are so fun. I think you're completely brilliant to use Vintaj patina to color some beads the way you did. 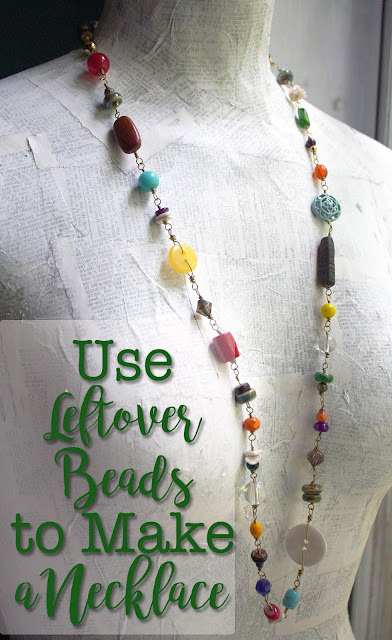 I wish I had thought of that before I spent too much time making itty bitty polymer beads. Also, I think I need a jig so I can make fabulous wire frames like yours. Tammy, Aw, thanks so much!! 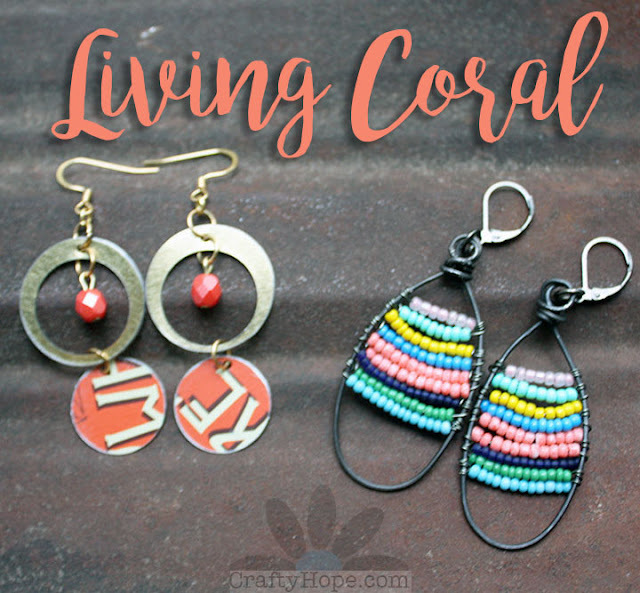 I was a little disappointed to not find more coral in my stash, but I'm trying to use what I have since I have SO MUCH. 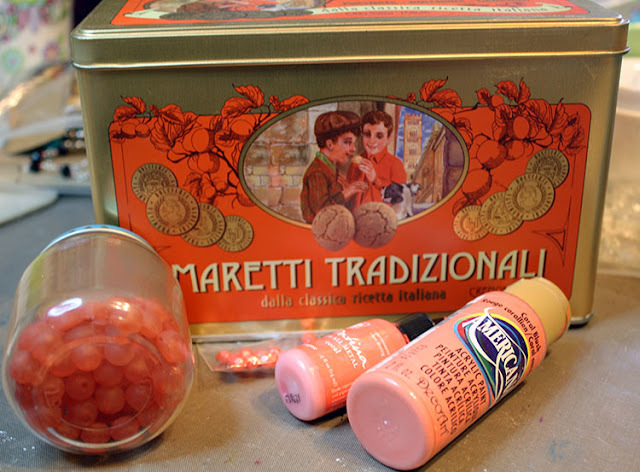 And, if coloring beads to tint them how I need them is the way to use it up, that's what I'm going to do. It's taken me years to finally get the idea that it's okay to alter something from its original. Now, I alter all the things! Ha! My wire is such a cheap-o, but it does come in handy in a pinch. Of course, you could also just put nails most of the way in a board to create the shape you want too. There are also really nice other models out there if it's something you think you'll use often! Have fun. I'm so glad I inspired you!! Yay! omg you colored your beads? I am amazed by that! 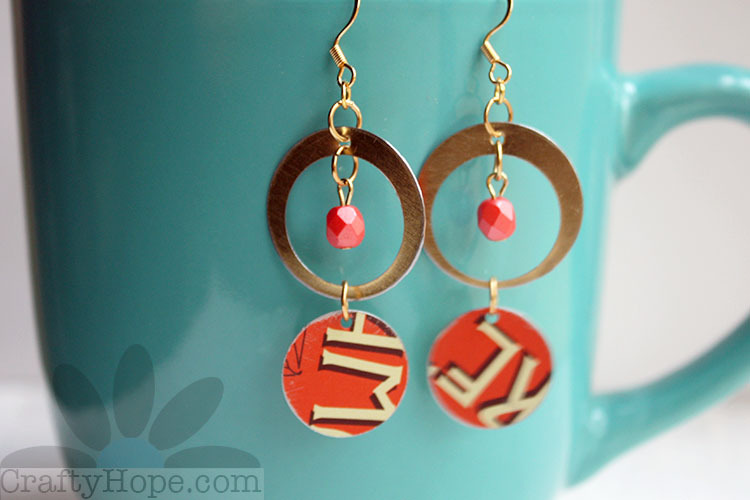 these are both so fun and I'm mesmerized by the tin earrings. I bought Lorelei's tin snip tutorial and have been figuring out how to work with tin ..... and this is just such a cute way to use an old tin! Your idea to color your beads was brilliant, and the earrings turned out great! I love the second pair - gold does seem to go surprisingly well with coral, and yours showcase both with a super-fun vibe. Thank you! I do like jewelry that is fun as well as pretty. I'm so glad that came across in these. Thanks so much for taking the time to see what I created and even more so for leaving your kind words. It means so much! The Master of altering! I didn't participate for lack of suitable beads and self-imposed ban on buying new, didn't even think about dyeing! You nailed it!